Parking.com has convenient parking near City Hall. Click on the map below for more information on parking rates, hours of operation, and entrance locations. 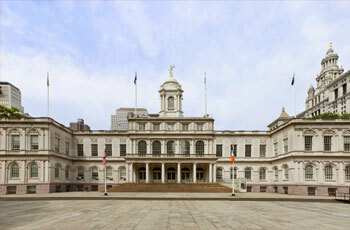 New York City Hall is located at the center of City Hall Park in Lower Manhattan. The building is the oldest functioning city hall in the United States, and is home to the office of the Mayor of New York CIty and the chambers of the New York City Council. City Hall is conveniently located near many popular NYC attractions, including Zuccoti Park, the 9/11 Memorial, South Street Seaport, Brookfield Place, and the Financial District.